Pumpcarvgo 2014 - Go anywhere. Bring anything. Yeah, we archive previous years' flyers. We're nostalgic that way. It's PUMPCARVGO time, everyone. Second annual! Come celebrate the season with us and show off your pumpkin carving skills the afternoon of Sunday, October 26, 2014. -You can just chill out and watch the scene. We'll have live music and some refreshments. Feel free to bring some to share. 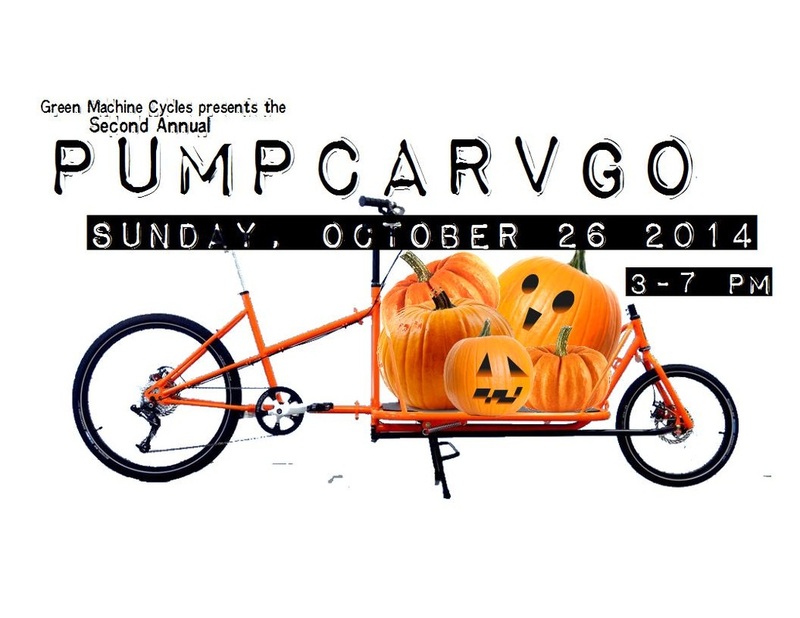 Last year we asked folks to bring the largest pumpkin or the most pumpkins they could manage on their cargo bikes, and there were some very respectable efforts. Don't let your friends outdo you! You don't need a cargo bike, however, and you don't even need to show up on a bike, but it's obviously more fun if you do. We will have tables set up for carving and will collect pumpkin flesh and seeds for those who wish to use them. The rest will be appropriately composted. Did we mention live music? If the musicians want to play late into the night I think we will let them. Hoedown!